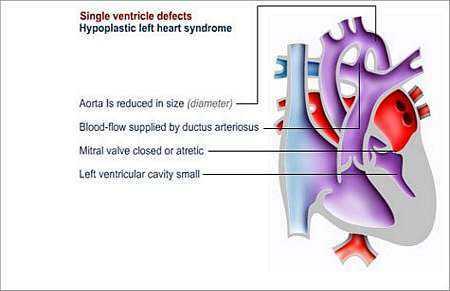 Hypoplastic left heart syndrome concerns a number of problems on the left side of the heart. The aorta (the main artery that channels blood away from the left ventricle of the heart to the body) is narrow and the left ventricle (left lower heart chamber pump) is small. This leads to inadequate flow of oxygenated blood to other parts of the body. 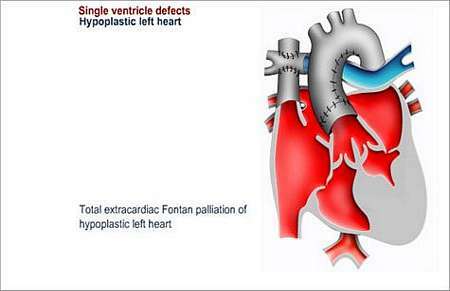 Hypoplastic left heart syndrome is a rare, but serious condition. It is the most common cause of death in infants with heart disease during the first seven days of life. During the foetal stage, when the baby is still in the womb, connections (such as the ductus arteriosus) that form part of the foetal circulation assist to bypass the problems. However, within seven days from birth, the ductus arteriosus closes and the baby becomes short of breath and cyanotic (blue discoloration of skin). Without emergency surgical correction of the heart lesions, the baby will die. In addition, the aortic and mitral valves are often narrow or absent. The mitral valve allows blood to move from the left upper heart chamber (atrium) to the left lower heart chamber (ventricle)]. 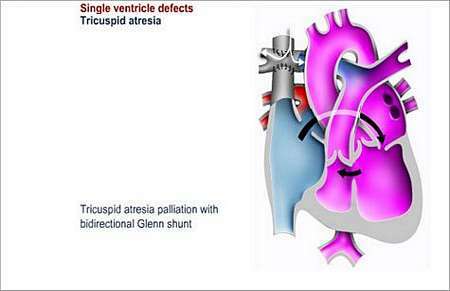 These babies usually have an atrial septal defect in addition to the patent ductus arteriosus. Without these openings, the left ventricle is shut off from the rest of the heart and aorta. Oxygen-rich blood cannot flow from the left ventricle to the rest of the body via the aorta and has to first go to the right side of the heart via an atrial septal defect (hole in atrial septum wall). Oxygen-rich blood then reaches the body by passing through the atrial septal defect into the right atrium and from there to the right ventricle, which pumps the blood into the pulmonary artery. From here the blood moves back to the aorta via the ductus arteriosus (a temporary connection from the foetal circulation). During the first week of life, the ductus arteriosus closes up. The baby may seem normal during the first few days after birth, until the ductus closes and oxygen-rich blood can no longer reach the rest of the babys body. The babys skin turns blue (cyanotic) when the body does not get enough oxygen-rich blood, and the baby will need immediate emergency heart surgery or a heart transplant. During the initial few days after birth, the baby may seem normal. By day 2 and 3 the baby will become grey in colour, unable to feed, short of breath and eventually collapse. The majority of these babies die within the first week of life. Echocardiogram (cardiac ultrasound) An ultrasound (sonar) during pregnancy may enable early diagnosis (in some cases by the 18th week of pregnancy; in other instances, the condition may only develop at a later stage in pregnancy). 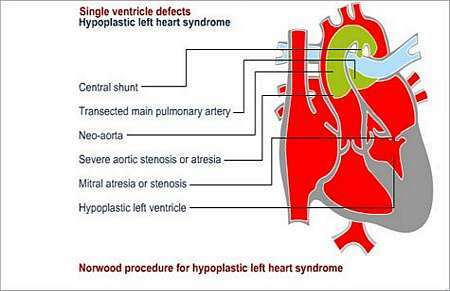 There are two treatment options for hypoplastic left heart syndrome. Firstly, heart transplantation; alternatively, a palliative operation to relieve distress, which unfortunately does not cure the condition. Palliative (ease without curing) care is the mainstay of treatment and is performed in a three-staged operation process, called the Norwood procedure. Although the Norwood procedure is more commonly performed, because of problems surrounding donor hearts, survival rates for heart transplantation and the Norwood procedure are more or less the same. This stage of surgery needs to be performed soon after birth. The aorta is connected directly onto the lower-right heart chamber (the right ventricle) and the ductus arteriosus is closed. Performed at approximately 6 months of age. The Vena Cava Superior (vein that brings blood back from the upper part of the body to the right upper heart chamber) is connected to the pulmonary artery. Performed at age 1 to 3 years. The inferior vena cava that carries oxygen-poor blood to the heart from the lower body is connected to the pulmonary artery that transports blood to the lungs. The child will need to visit the outpatient department frequently for future follow-up. It is important to prevent endocarditis in children with hypoplastic left heart syndrome. Endocarditis is an infection of the lining of the heart or heart valves. The patient should wear a Medic Alert card/bracelet stating the need for antibiotics before certain forms of surgery or dentistry. The Hypoplastic left heart syndrome support group can be of valuable assistance to the family.